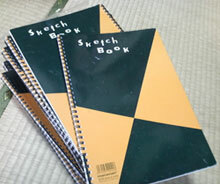 Summaruy: On February 4th, 2009, Wacom, known for its graphics tablets, posted an interview on its official website with Iwamoto Tatsurō, one of the main character designers of the Gyakuten Saiban (Ace Attorney) franchise. In this interview, Iwamoto tells about how he first got into drawing, why he became a freelance illustrator after working at game developers, the thinking process behind creating characters like the ones we know from Gyakuten Saiban and of course, how the drawing tablet plays a work in his life as an illustrator. Images are taken from the source article. Copyright belongs to their respective owners. Wacom: What was the reason you started drawing? Iwamoto: I don’t recall any particular reason… If I wanted to act cool (laugh), I’d say my earliest memories are of me drawing with crayons. Back when I was a child, we had this bundle of large sheets of paper at home, which my father used for his work. The back of these sheets were all completely white, so I used to draw on them when I was little. It was a lot of fun. And then I guess I could say that because I was so bad at physical sports, I ended up drawing. I’m really bad at sports, and I’m about the same with studying. The one activity I looked good at was illustrating. I think I spend more time drawing in junior high and high school than with my friends, and it became one of my strengths. Wacom: If you have fun with drawing and it’s actually something you’re good at, well, that’s killing two birds with one stone. What kind of drawings did you make back then? Iwamoto: Whenever I’d find some empty space in my textbooks at school during class, I’d draw characters from anime and manga I was into at the time. From the lower elementary grades until fifth grade, it was mostly Kinnikuman, and later, because of my brother, I’d draw things from AKIRA. Wacom: During class, and in your textbooks…. Iwamoto: Drawing in the textbooks might’ve been my first steps as an illustrator (laugh). I wasn’t drawing over the illustrations in the textbooks, I looked for empty spaces in the books to draw. I never listened to the lessons and was only drawing, so perhaps the path of the illustrator was all that was left for me…. Wacom: Did you try some sports when you were a student? Iwamoto: Yes, I was in the judo club for all three years in high school. I had visited the arts club, but the atmosphere there was rather dark, so I thought it was nothing for me and decided to go to the judo club. I had always loved martial arts, and I thought I was better at it than any ball sports. You’ll actually find very few people working in the graphics industry who have spent their whole life only on the arts. Wacom: You went to an arts college. What was your major? Iwamoto: My major was commercial design. Mostly designs for magazines or posters. The focus lay more in design than in actually drawing, so we didn’t have faculties like oil paintings where you’d learn how to do sketches and things like that. But I myself was more interested in drawing tan in design, so each time I had to hand in an assignment, my professors would say my designs were sloppy and that I spent too much effort on the illustrations. Wacom: Your current work is mostly illustrations, right? 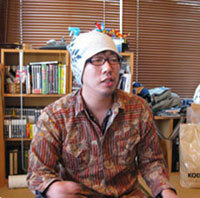 Iwamoto: Yes, I’m mainly working on game designs now. I’m actually a fan of history, and am especially interested in the Three Kingdoms, the Sengoku period and the Bakumatsu period. So that’s why I also have historical drawings on my business card. So I hope I’ll be able to work on something that has to do with history. I’d love to do something different than game design. Wacom: You are now a freelance illustrator, but you used to work for game companies. Why did you become a freelance artist? 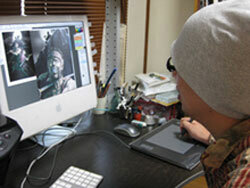 Iwamoto: I started about two years ago as a freelance illustrator. When I was working for a company, I felt that I was doing a job under safe circumstances, as part of a larger organization. But that was I thought was frightening. “What can I do all by myself?” “I want to be able to accomplish something on my own.” I think that is why I decided to go freelance. And it’s also simply because I wanted to earn money by drawing. The game industry is lately moving towards 3D. 2D is of course also appreciated, but I didn’t know whether I’d be able to keep on creating 2D art and make something interesting with that. So I felt that if I wanted to keep on illustrating in the future too, I’d needed to go independent and learn the techniques so I could work on my own. Wacom: Did you feel anxious about going freelance? Iwamoto: I was of course anxious. Before I actually made the jump, worries about whether I’d find any work were all that were on my mind. But now I have fun! There are of course things that are hard, but it had been my dream to make a living by drawing. Wacom: You do look like you have fun with your work. Let’s ask you about how you create your work now. What kind of images do you have in your mind when you start on an illustration? For example, do you already work on the image in your mind before you actually start, or do you come up with something as you’re working? Iwamoto: I do both. I play a bit with it in my head, and then I make a rough sketch in my sketchbook. It happens often that I’m not so much thinking about it, then letting my hands do the work. When I working on character designs, I also think of the personalities. When I start on a character design, I always ask the director of the game about the character’s age, length and their basic backstory. Based on that, I come up with my own interpretation and ideas, like “this person weighs about this much” or “this person doesn’t like wearing shoes” (laugh). And as I’m drawing, new ideas, like wanting to add this, or thinking it needs a bit more here, pop up. The design of a character will become deeper in a natural way as I myself spend more time with them. But as they’re my interpretation of a character, it sometimes happens they end up differently from what the director of the game had in mind with their scenario. So when a director tells me that this or that doesn’t fit because of the story, I’ll take that with me and work on it again. Wacom: I see. Behind each character hide many stories and memories of you. What are some of the other things you do when designing a character? Iwamoto: A senior designer, who was the main designer on Gyakuten Saiban (Ace Attorney GBA), taught me a lesson which I still hold as my motto. “When designing a character, keep it simple and narrow it down to a key point. But in return, exaggerate those points you narrowed it down to all the way to the end! I think it’s best if a character design has one or two characteristics you immediately think of when you think of them. “This [characteristic], that’s gotta be [character]!” For example, a unique hairstyle and flashy clothing. 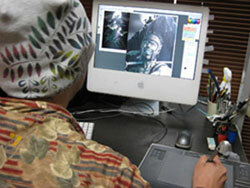 I am the second main character designer of the Gyakuten Saiban series. I worked on the first game as a secondary designer, and took over as the main designer for the second game. When I was the secondary designer, I looked at the designs of my senior who was the main designer as my textbooks and I still have much respect for her. Wacom: The characters in Gyakuten Saiban all have very rich expressions. What do you focus on when drawing these character expressions? Iwamoto: I think there were no mystery games before Gyakuten Saiban where the characters would change expressions all the time, right? The director of Gyakuten Saiban wanted the game to have a manga-esque energy to it. So what I paid attention to was giving the characters a diverse gap in expressions in order to pull the players in. Iwamoto: The gap the expressions they usually wear on their face, and the ones they only show for a second. Like a character with a serious expression that suddenly changes in something that makes you go “Whaat!” or a character who’s always fooling around who suddenly looks all smart. I want the players to have fun with these character expressions, pulling them deeper in the game. Wacom: How do you come up with these ridiculous faces that make us go “Whaat!”? Iwamoto: I practice them by looking in the mirror (laugh). And owarai comedy! I study the DVDs of comedians I like. Wacom: Oh, so you use the facial expressions of comedians in your work! For your work, you make use of one of our drawing tablets. What do you think is convenient about them? Iwamoto: In my line of work, I have to draw digitally. So to draw digitally means you need a pen tablet. It’s easy to correct your drawings when you’re working digitally, so a tablet is a necessary tool of the trade. Wacom: When did you first start working with tablets? Iwamoto: The first time was in college. A friend recommended it so I got one. Then I started working at a game developer, so the company gave me a tablet on loan. It was a large one, and you could really sense my seniors had spent quite some time working on it. I’d have liked a smaller, new one too though. Wacom: How did you think about working on tablets? Iwamoto: I wasn’t a fan of it at first (laugh). “Who knows how drawing digitally will go?” “Illustrations should be made on paper, colored by hand!” But I had to undergo a Spartan training in my first year at the company, so there was no other option for me then besides for the tablet (laugh). Iwamoto: And I also think it’s because games are not art. Games are not art, they are something for people to enjoy. So the task for game developers is to release something good in a fast and consistent matter. And to do that, a tablet is absolutely necessary. Wacom: Could you tell us what you personally focus on as an illustrator? What do you think an illustrator should be? Iwamoto: My love for drawing is unrivaled! I want to draw the things I like, and in the best way I can. When I went from up elementary, junior high and high school, I hated seeing my old drawings. But to consider your art of only one, two years ago to be bad, means you’ve been developing your skills, right? I’d be afraid I’d ever hit a stop, so I hope I can forever look at my old art bad and think it’s bad (laugh). Wacom: Something about your hobbies then. You wrote on your blog you make silver accessories. Are there common points with illustrating? Iwamoto: Is it really still a hobby? If I'm going to relate it to illustrating? (laugh). You can divide illustrations roughly in two types: illustrations with a realistic touch to them, or illustrations with flavor. I am better at illustrations with a realistic touch to them, but to draw something like that, you need to be able to think of an object in three dimensions. You need to be able to draw something like you feel you could go around it, to the sides that aren’t drawn. So I think that making these three dimensional accessories help me with that. I guess you could say that I only learned to make these accessories because I’ve been drawing all this time. And I also like working on something all the time until I’m completely satisfied with it. And these silver accessories are practical, because I can wear them normally (laugh). Wacom: One final question. Is there something you want to do in the future, or do you have some dream? Iwamoto: Like I mentioned earlier, I’d love to make illustrations with a historical theme. And not just illustrations. Perhaps I’d like to try a historical manga. And it would be great if I could work as the main designer on a game from the beginning this time and help build a long-lasting franchise. It was Gyakuten Saiban that taught me so much, so I want to work on a game that’ll turn out as good as Gyakuten Saiban.